On December 20, Raines will be hosting our first bi-annual, "Taste of Raines". It is an opportunity to showcase our Visual and Performing Arts program and to raise monies to build a dance room, a stage and lighting for our theater space, and much more. 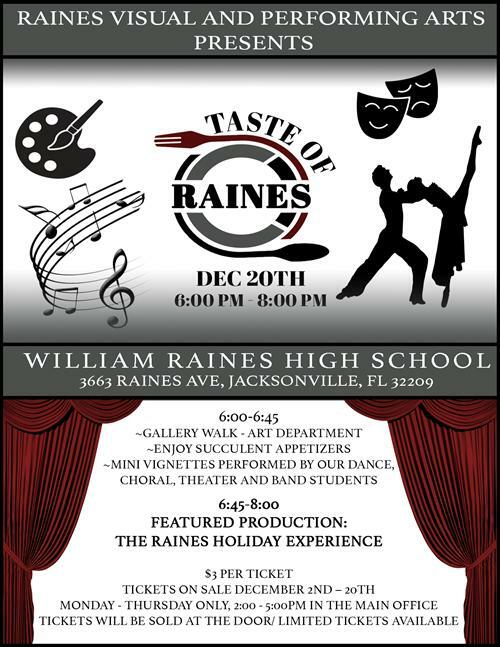 The Tickets for the “Taste of Raines: Holiday Edition” are on sale now in the main office at William Raines High School for $3 per person. Tickets will also be available at the door the night of the event.